The city of Pisa plays host to treasures of priceless value, making it one of Italy’s most important cities of art. The Piazza dei Miracoli, with its world-famous Leaning Tower, is the hub of the prized artistic and architectural offerings. To round off the artistic delights of the square are the Museum of Sinopie, housing the preliminary drawings of the frescoes of the Monumental Cemetery (Camposanto) and the Museum of the Cathedral (Museo dell’Opera) with its vast collection of sculptures, paintings and ancient relics. Pisa’s Ancient Maritime Republic has a great deal to offer besides the renowned Tower and is well worth a few days’ stay, just enough time to take in all of its gems. 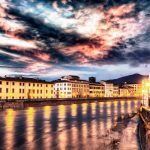 The city grew and developed in and around the inlets of the Arno, which lend the view of the Lungarni and the majestic grand ducal buildings, Romanesque and Gothic style churches and the overlooking Medieval and Renaissance fortifications. The allure of the Lungarni has featured in works by such authors as Byron, Shelley, Montesquieu, Leopardi, Carducci, D’Annunzio and Foscolo. The Lungarni are especially spectacular at night with the lights from the lamps and buildings reflecting on the water of the river. On the evening of June 16th, in celebration of the patron saint, the outlines of the buildings and bridges are decorated with thousands of lights: this is the magical atmosphere of the Luminara (illuminations). The Gioco del Ponte (Game of the Bridge) is also held on the Lungarni. This famous historical commemoration entails a long costume parade, after which the two town districts of Tramontana and Mezzogiorno challenge each other to a test of strength where they try to push a heavy cart on rails into the opposing field. The patron festival, held as part of the Giugno Pisano events, draws to a close with the Regatta of San Ranieri, a boat race which is a legacy of the prestigious tradition of Pisa’a Maritime Republic. This tradition can also be traced to the more recently established (1956) Regatta of the Ancient Maritime Republics. The Renaissance-style Piazza dei Cavalieri is open for visits just a few minutes from the Tower. A symbol of the Medici rule over the city, it was commissioned by Cosimo I in honour of the Order of Knights of St. Stephen and was designed by Vasari. 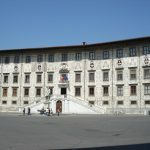 It houses the most important buildings and churches of Grand Ducal Pisa, in particular the Palazzo dei Cavalieri (also called Palazzo della Carovana) with its majestic façade. The very identity of medieval Pisa is echoed throughout its historic centre, teeming with a dense network of alleys. The street of Borgo Stretto once united two bridges that allowed passage on the waterways Auser (today Serchio), to the north of the city, and Arno to the south. This is where the Church of San Michele in Borgo is located, an example of the rich patrimony of Pisan churches, with its beautiful façade featuring an intriguing detail: early 17th-century inscriptions by students singing the praises of the candidates running for University Rector. The National Museum of San Matteo houses important collections of medieval Pisan paintings and sculptures, wood carvings and illuminated manuscripts. The National Museum of the Palazzo Reale, formerly a summer residence of the Medici family, displays period furnishings and tapestries as well as a collection of arms from the Gioco del Ponte. It also houses a plaster cast gallery and a collection of paintings by Antonio Ceci. Other churches worth a visit are Santo Sepolcro on the Lungarno Galilei, built on an octagonal plan inspired by the model of the Church of the Holy Sepulchre in Jerusalem, and the peculiar Church of Santa Maria della Spina, built in 1230, a remarkable example of Gothic art in Europe. The origin of the name can be traced back to the fact that a “spina” (thorn) from the crown worn by Christ at his crucifixion, was preserved here. Another must-see church is the Chiesa of San Paolo a Ripa d’Arno, also by the riverside. Out of town but equally impressive is the Romanesque Basilica of San Piero a Grado, where, according to legend, the apostle Peter landed in 44 AD. The monumental three-aisle interior is impressive; the outside features three apses at one end and a fourth apse in place of the façade at the other. Illustrious names from the Italian science tradition can claim Pisa as their birth city, including mathematician Leonardo Fibonacci, physicist Antonio Pacinotti, and the world-famous Galileo Galilei, father of modern science. Evidence of Galileo’s presence in Pisa can be found in numerous spots around the city, in a kind of itinerary that recalls important moments of his life. It sets off from the Leaning Tower, where the scientist carried out the free fall motion experiment, and the Cathedral, where a lamp led him to discover the isochronism of the pendulum, to then reach the house where he was born on 15 February 1564. The next ports of call on the tracks of Galilei are the Museum of Calculation Instruments, which houses several of his instruments, including the geometric and military compass, and the Domus Galilaeana, which conserves two autographed letters. Today the city of Pisa still holds its place as a centre of excellence in the field of research thanks to its prestigious University (founded in 1343), the Scuola Normale Superiore in the Piazza dei Cavalieri, the Scuola Superiore Sant’Anna and the National Research Council (CNR). A centre of art and ancient history, a unique destination for anyone in search of monuments of unequalled beauty, Pisa is a one-of-a-kind and is just the starting point for an exciting journey in discovery of a great many treasures that the environs are ready to unveil. The best way to discover Pisa is to book our Private Tour. With our Tours you can enjoy the best monuments and places of Pisa, in small groups. So the visit is tailored on your needs.